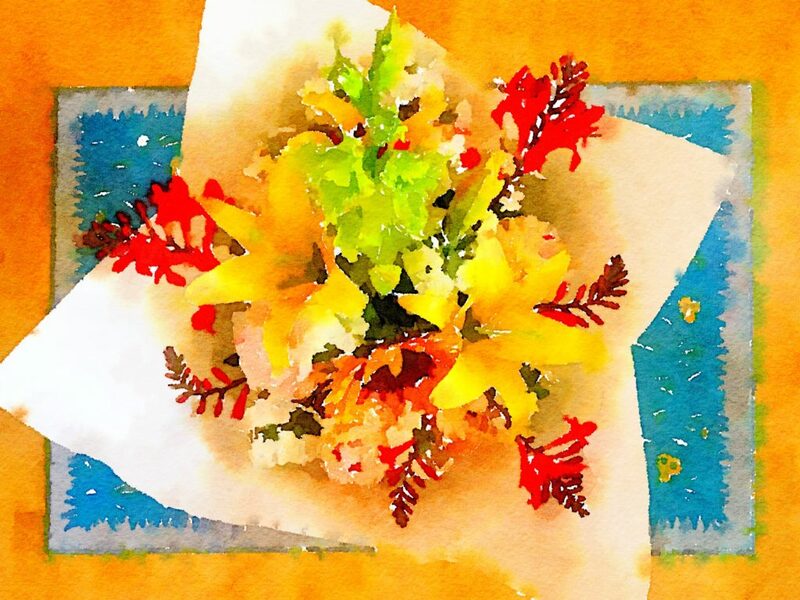 The Bouquet-a-Week Project kicked off with a stupendous array of flowers in Week Twenty-Five. 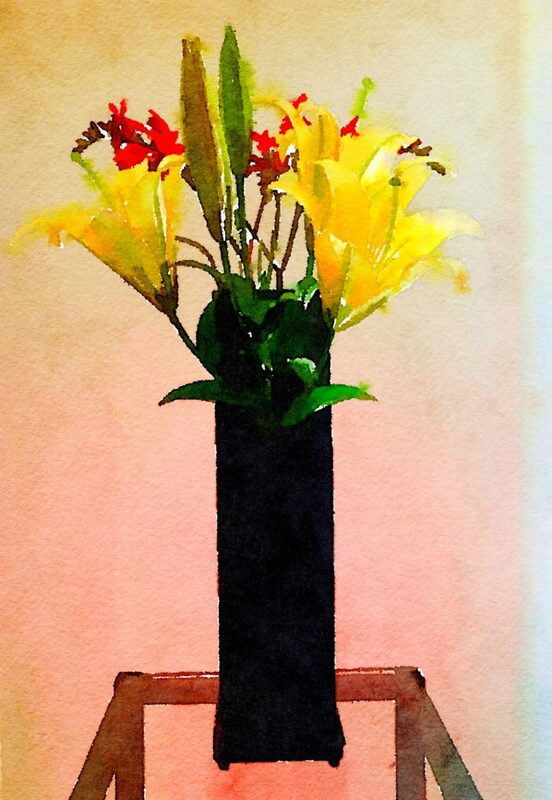 I was drawn to this beauty by the graceful lime gladiola, spiky kangaroo paws, single sunflower with its fuzzy brown eyeball, and yellow Asian lilies. 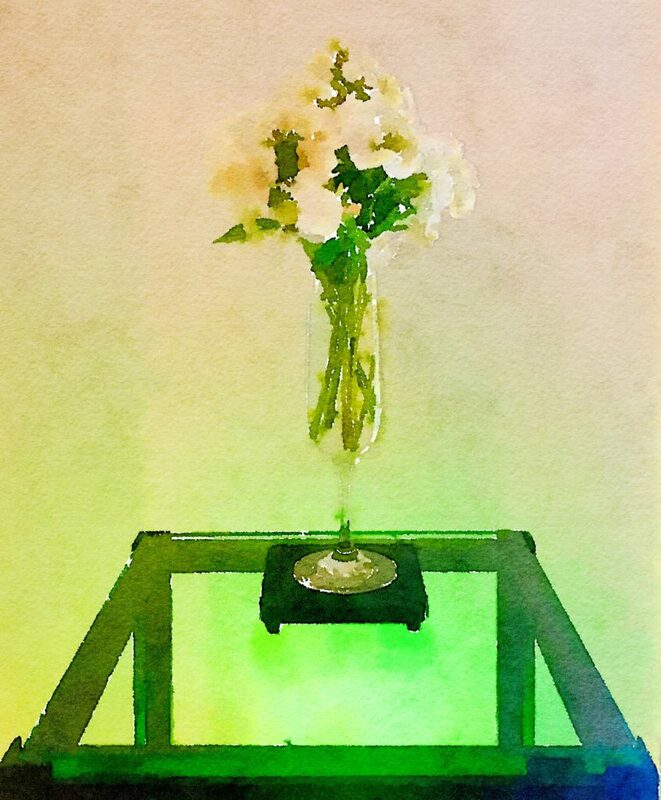 Pale-pink peonies and white golden arrow formed a pleasing framework around the major blossoms. 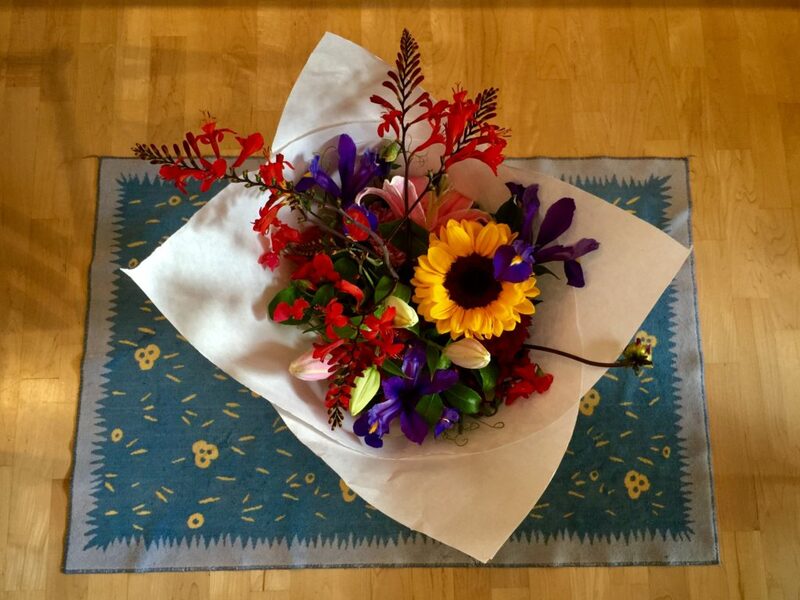 Here is the bouquet fresh from the Pike Place Market. 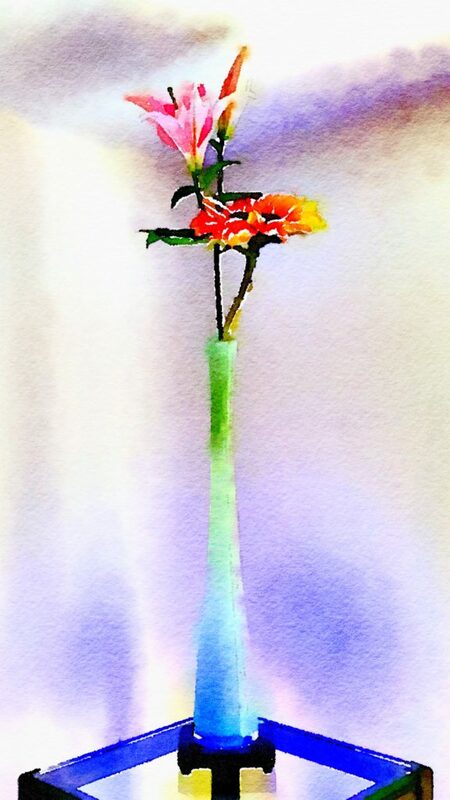 And here is the Week Twenty-Five fresh bouquet “painted” using the Waterlogue app. 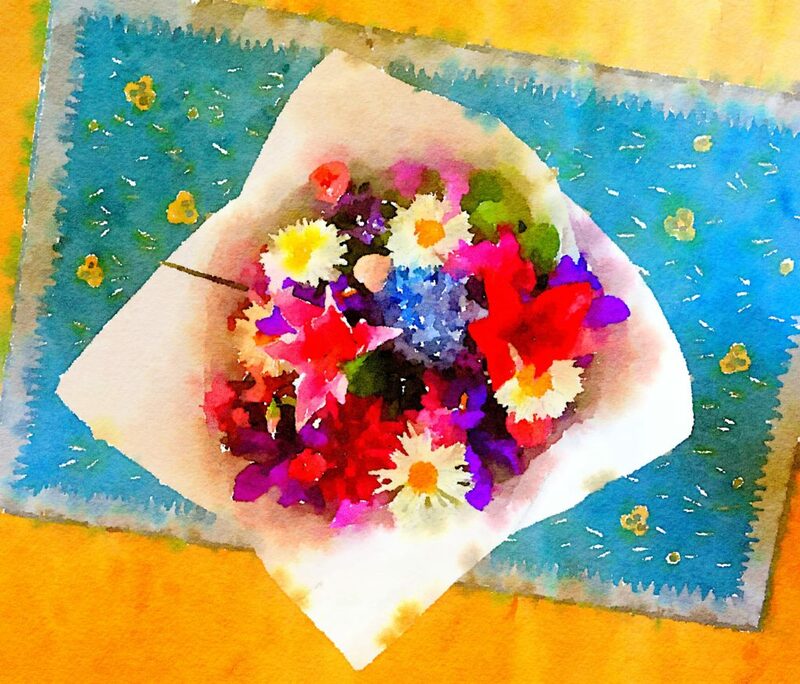 As I always do, I unfurled the fresh flowers from their white wrapping paper and divided the flowers into a loose pile. Then I cut the stems and stripped them of any small leaves that remained. 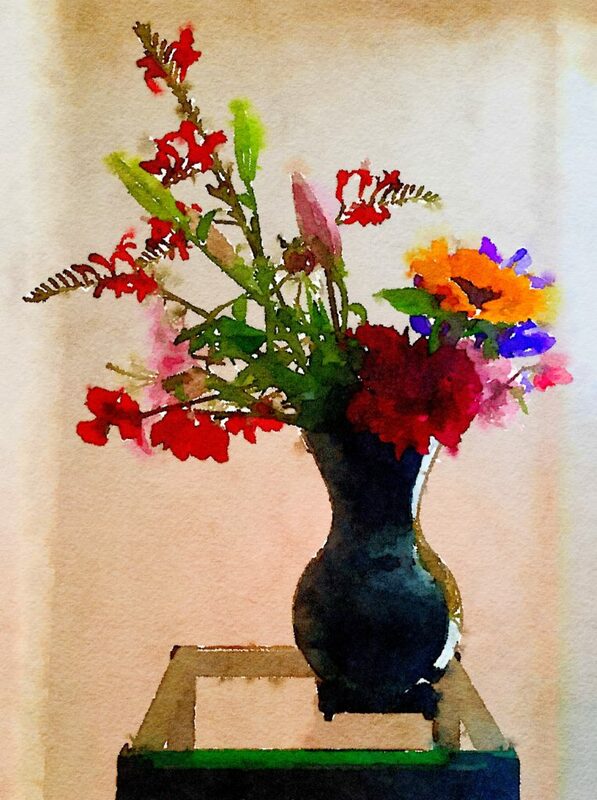 Next I “arranged” the flowers in a glossy-black, bell-shaped vase filled with water that would hydrate the blossoms until I could create the smaller individual bouquets. 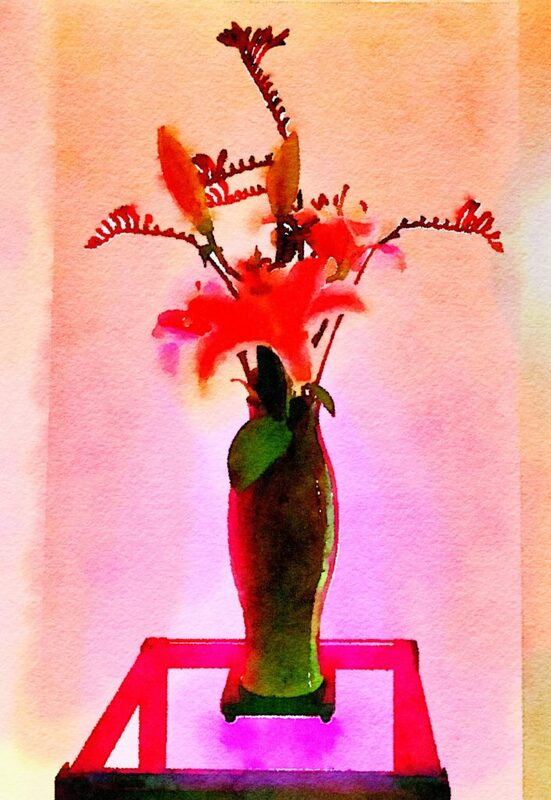 Here is that shot “painted” in Waterlogue. 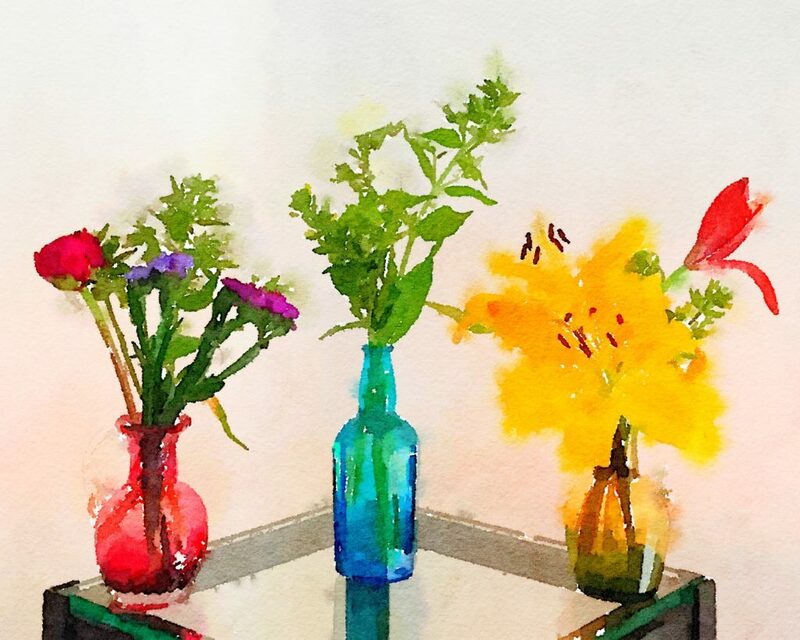 I liked it so much, I was tempted to call it a day, but that would defeat the purpose of the Bouquet-a-Week Project, which is to buy a fresh Pike Place Market bouquet or single blossoms for less that $20 per week, then design smaller arrangements. 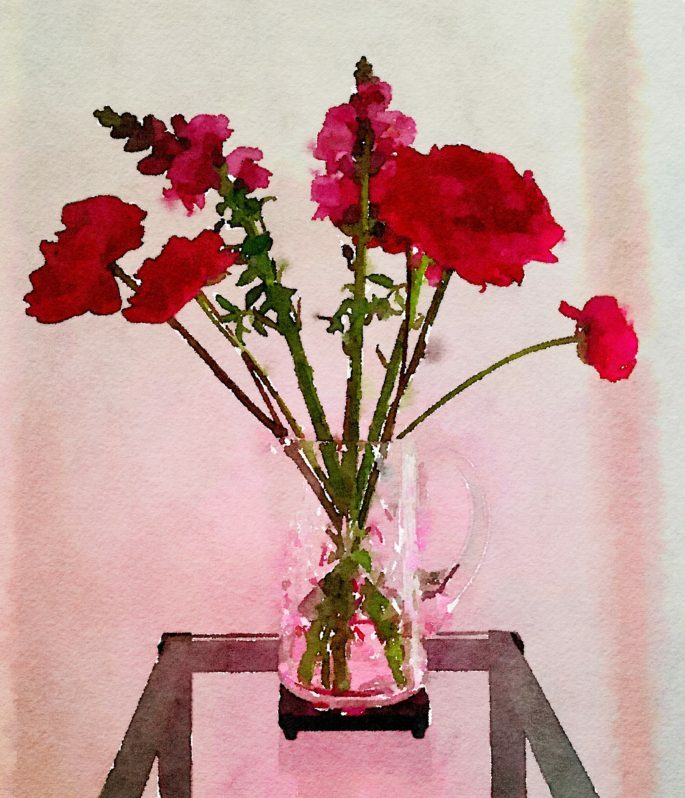 The first major bouquet of Week Twenty-Five means a lot because of the cranberry-colored, cut-glass vase, which is a family heirloom. There used to be two of them and the pair sat on either side of our mantel in the house where I grew up in suburban Philadelphia. Unfortunately, one got crushed when my parents moved from the family home in Pennsylvania to their retirement house in Austin, Texas. After my parents died, I inherited it. For years, it has sat in our bookshelves looking forlorn and, frankly, rather forgotten. 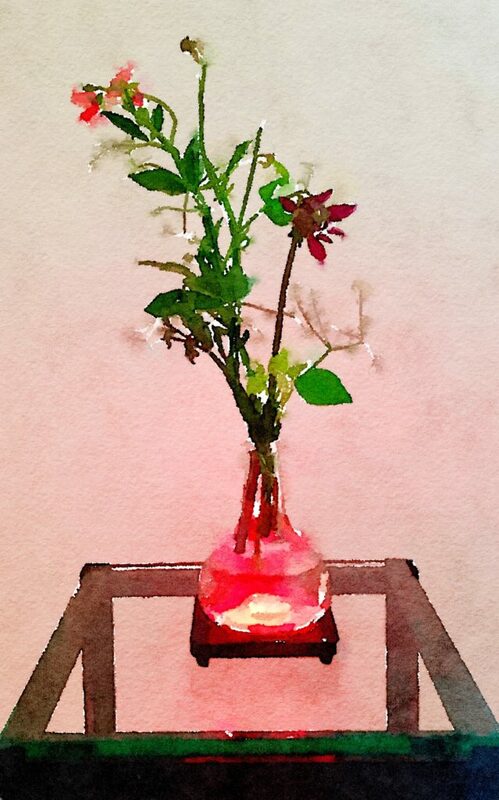 But, thanks to the Bouquet-a-Week Project, I pulled it down (very carefully! 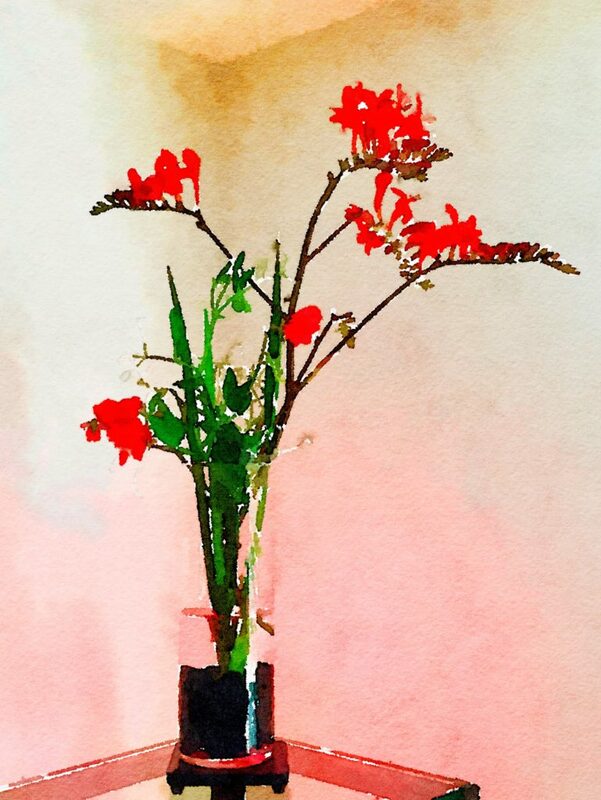 ), dusted it off, and graced it with the gladiola, peonies, and kangaroo paw. 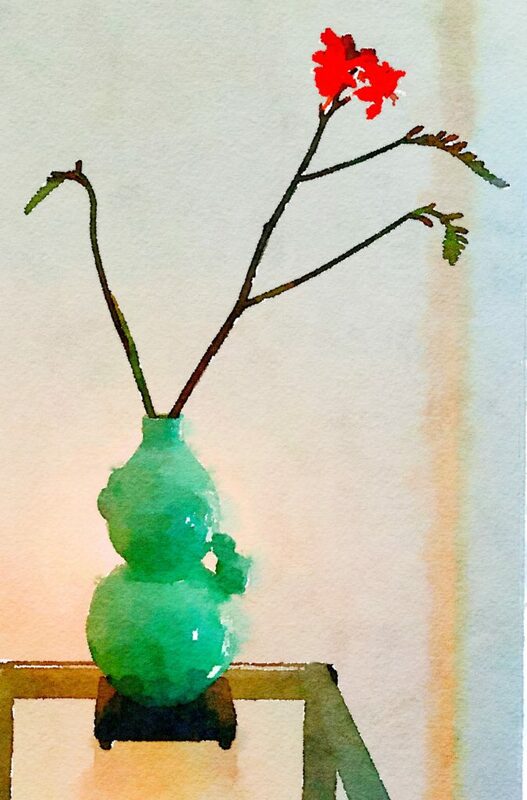 I imagined my mother looking down and smiling at her industrious daughter’s clever re-use of her beloved mantle-piece “objet d’art,” as she used to call it. 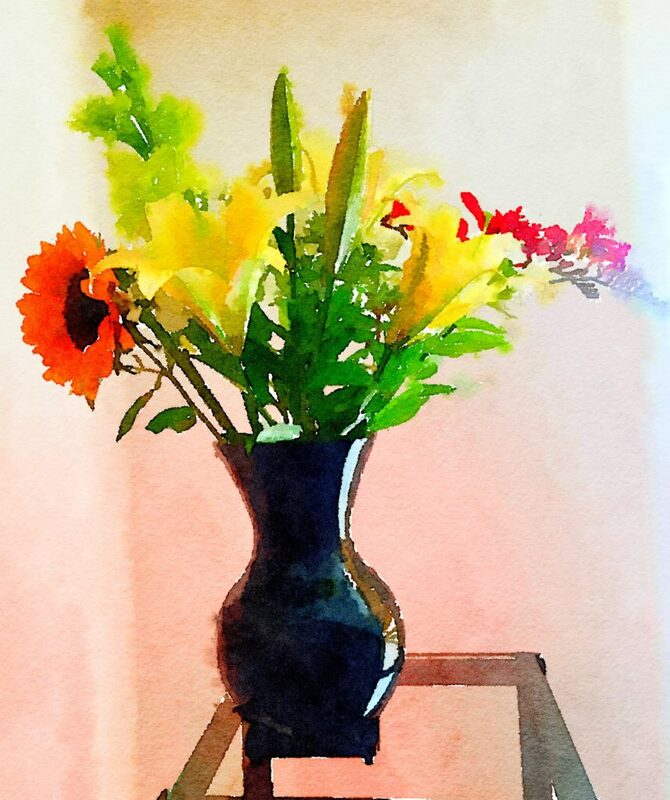 She was an amazing woman, and you can read more about her (specifically, the words I spoke at her memorial) on the Five More Minutes With website. 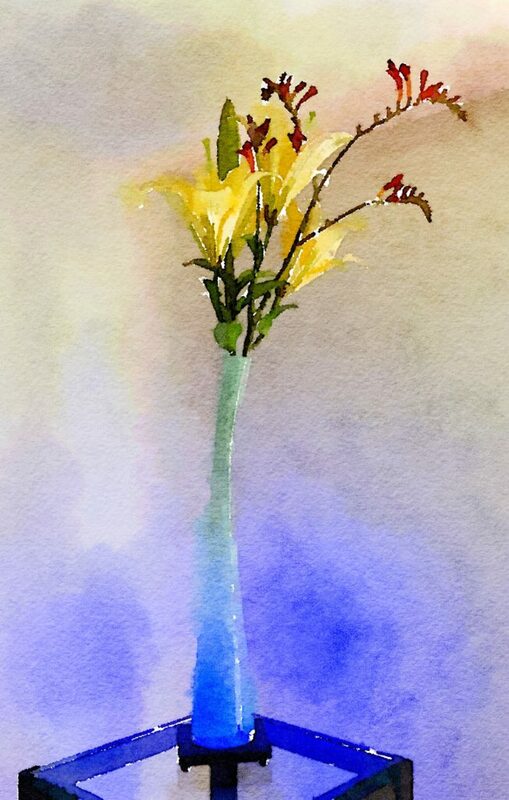 My favorite robin’s-egg-blue narrow vase is well suited to the yellow irises and another sprig of kangaroo paw. Majestic! 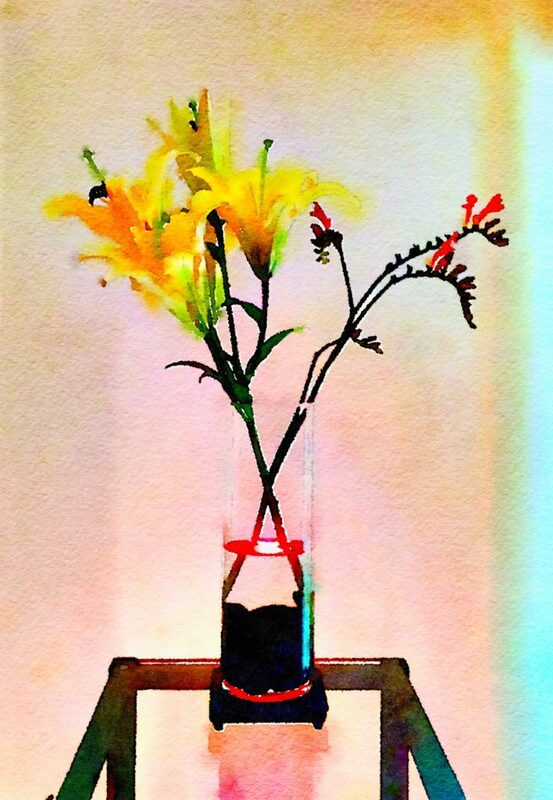 More yellow lilies and kangaroo paw form a fitting foil in an Asian-inspired vase with a double opening. A few days later, the peonies had faded so I took the remaining blossoms and created two “extra” bouquets. 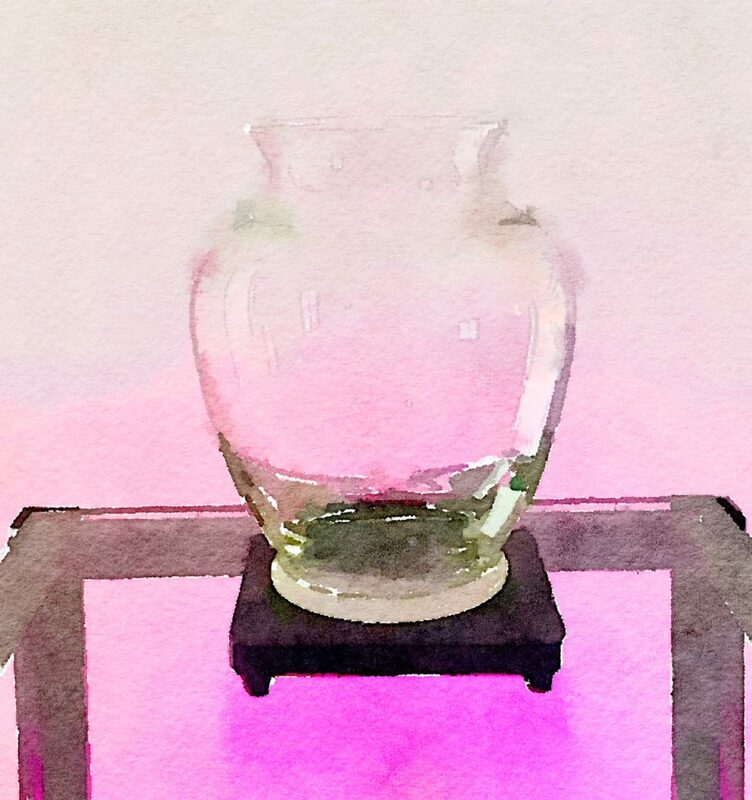 Taking this shot at night under a neon-pink back light using the “Bold” setting in the Waterlogue app resulted in this dramatic shot. 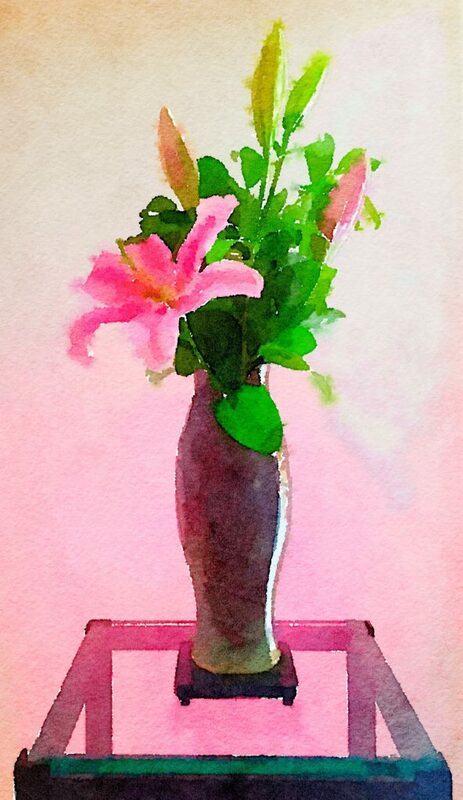 A small arrangement looks winsome in my pink Buddha vase. 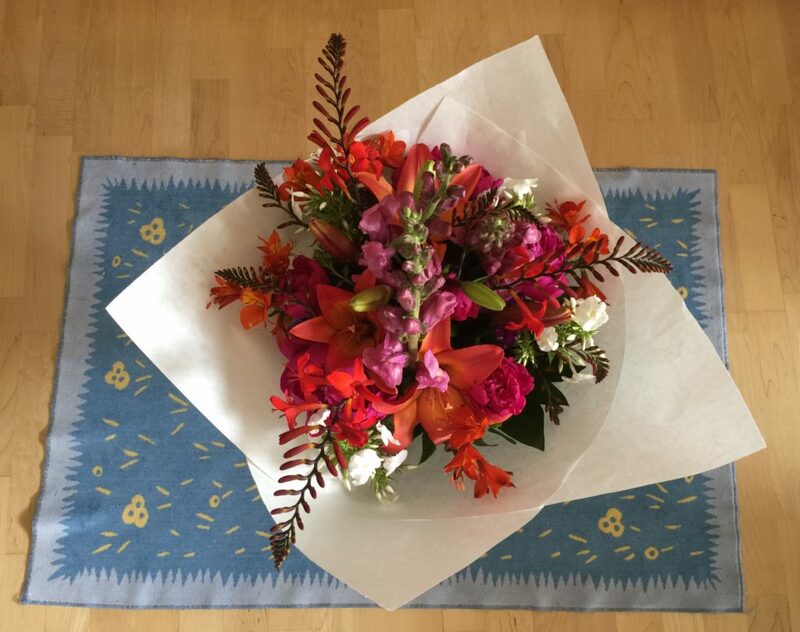 My sweet husband brought home the Week Twenty-Four bouquet and it was a bounteous beauty, bursting with several different types of blossoms that I hadn’t worked with much before. 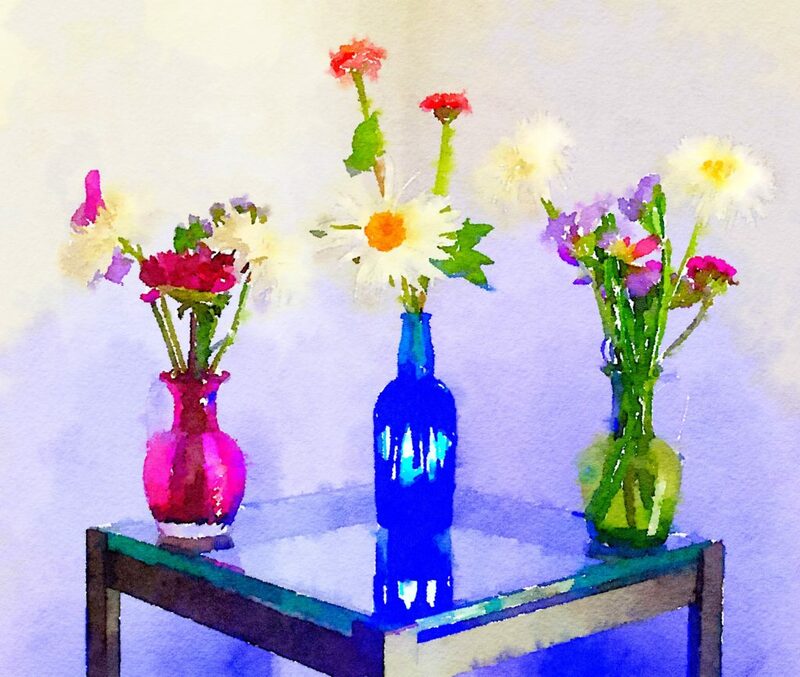 These included a vivid blue hydrangea, one huge scarlet dahlia, and three daisies with fuzzy faces that seemed to smile at me from the perimeters of the bouquet. Here are the fresh flowers from the Pike Place Market for the Bouquet-a-Week Project, Week Twenty-Four, which cost $15. 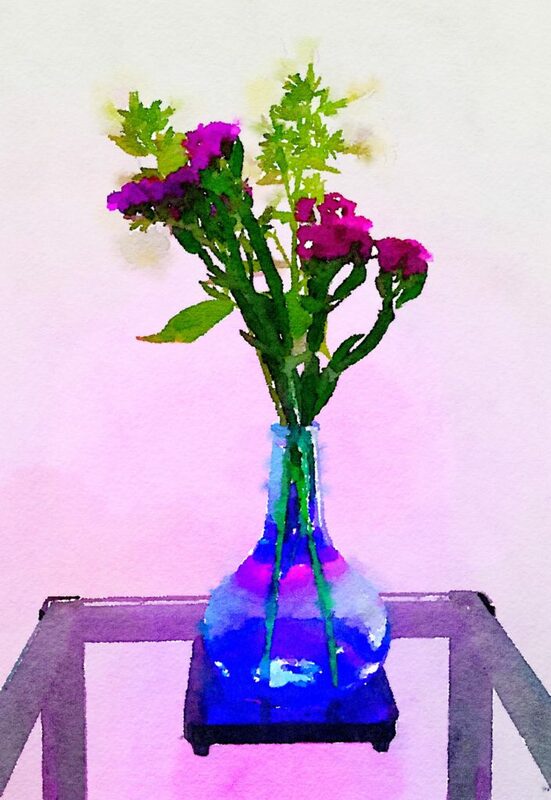 And here are the fresh Pike Place Market flowers “painted” using the amazing Waterlogue app. 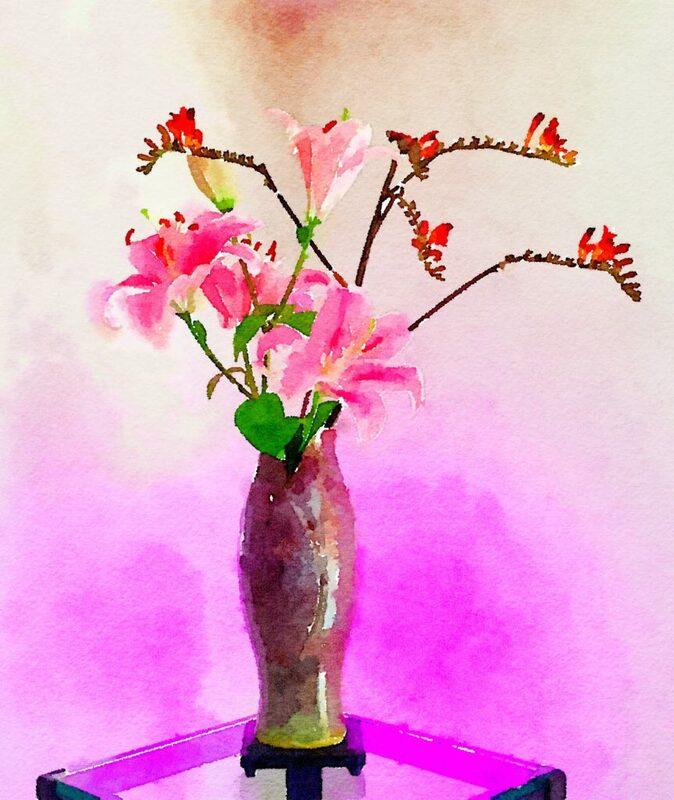 The gorgeous glob of pink Stargazer lilies caught my eye first, and I knew they would pair dramatically with a single sprig of kangaroo paw. 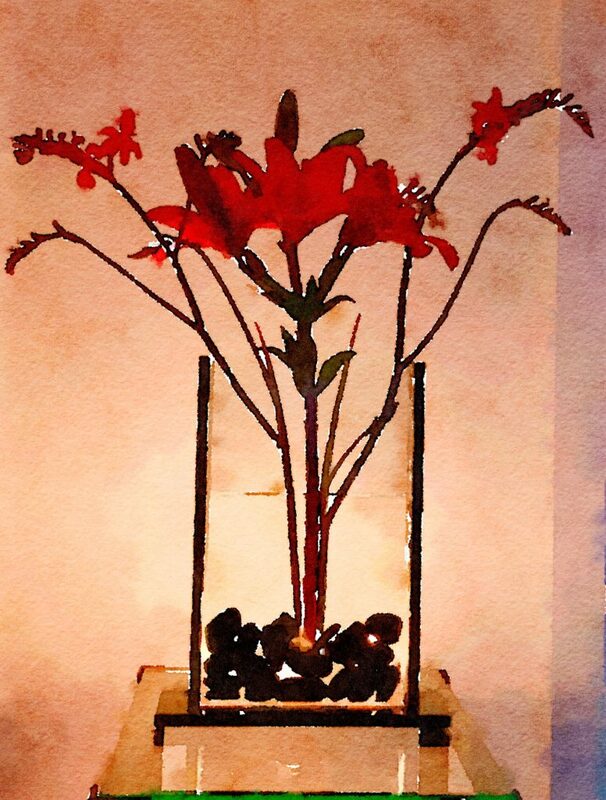 Next I made a grab for all the purple-and-yellow irises and the single crimson lily. 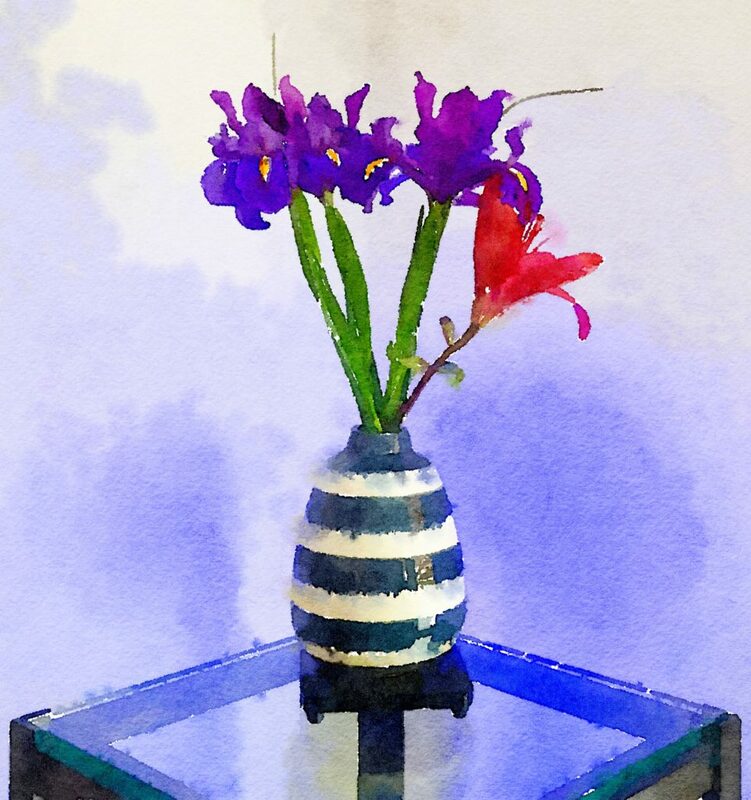 I like the way the lacy shapes of the irises contrast with the strong horizontal lines of the vase. 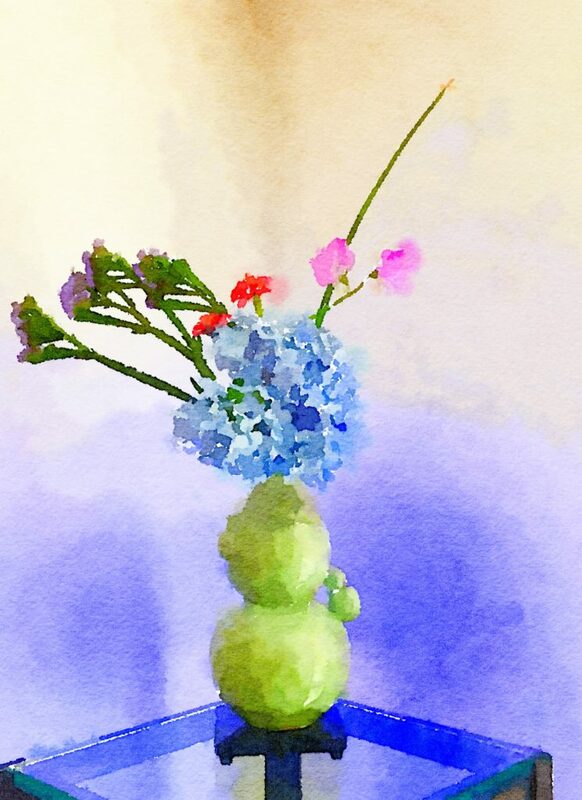 What to do with the single hydrangea? 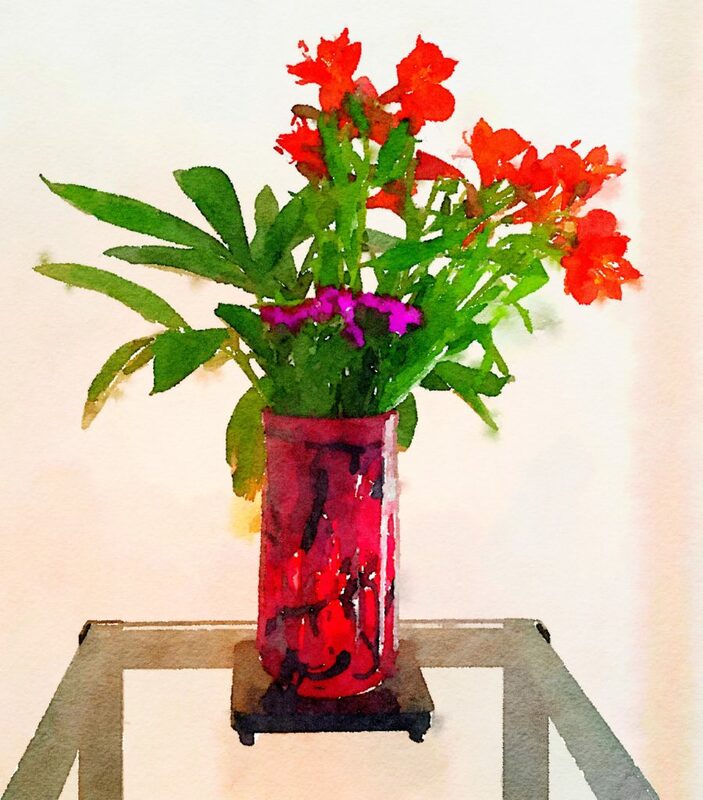 I thought my Asian-inspired celadon vase would form the perfect foil for such a singular bloom, especially when paired with pink sweet peas, two of the pink petunias, purple flowers, and a single spear of bear grass. 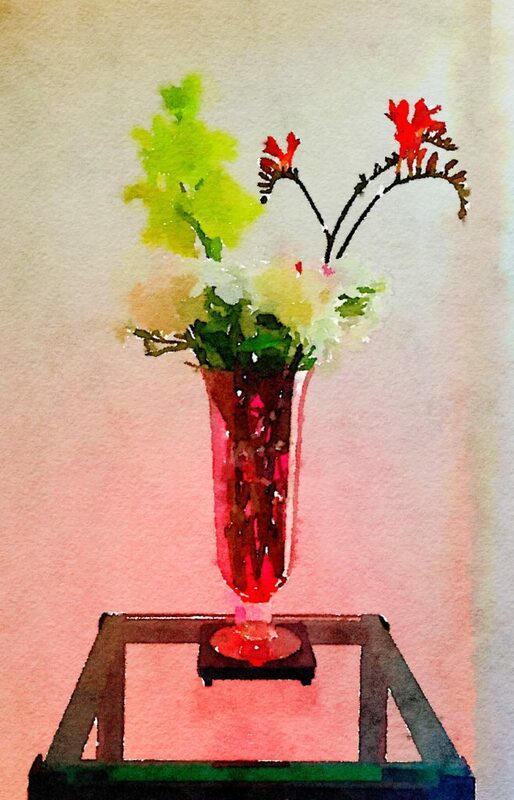 Here’s another design using a pink lily and a huge sunflower (left over from a prior bouquet) in my swooping robin’s-egg-blue vase, my ode to Vincent Van Gogh. 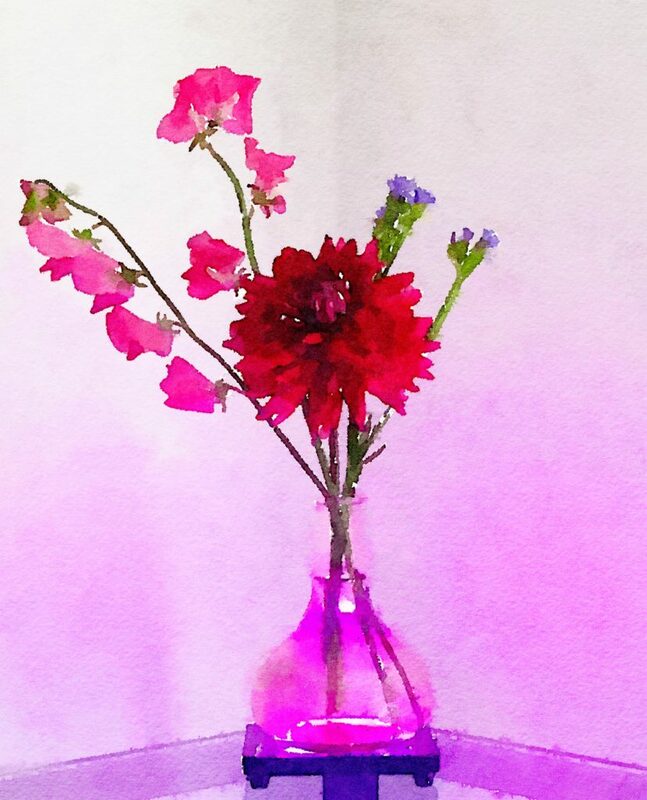 Sweet peas, that single crimson dahlia, and more purple flowers for contrast look fetching in a pink Buddha vase backlighted in fuchsia. 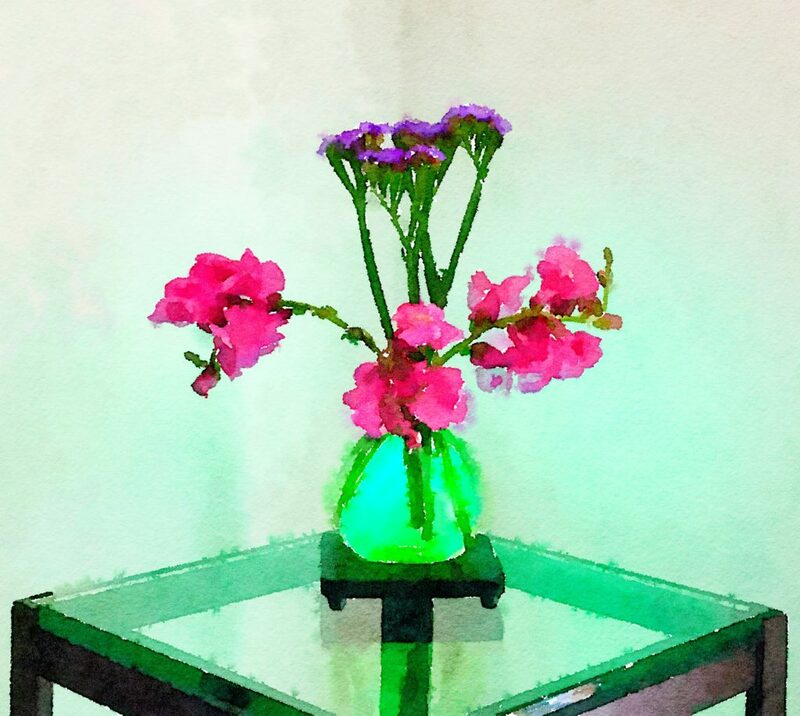 There rather droopy snapdragons and lively purple flowers look jaunty in a squatty, clear-emerald vase backlighted in green. 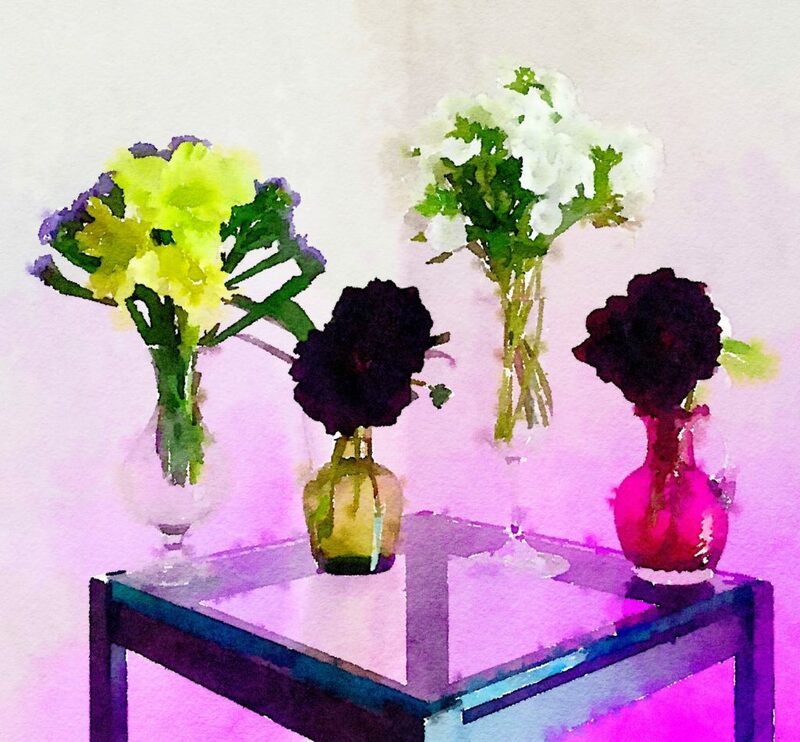 The Week Twenty-Three Bouquet was a lively mix that included a gorgeous sunflower, purple irises, kangaroo paws, and even a pink iris or two. 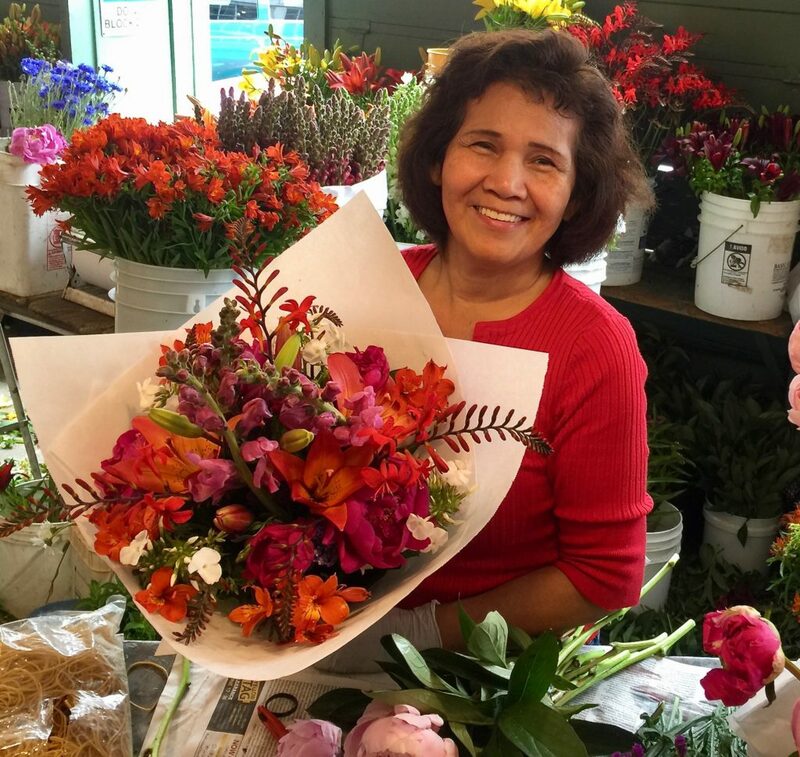 Here are the flowers fresh from the Pike Place Market. 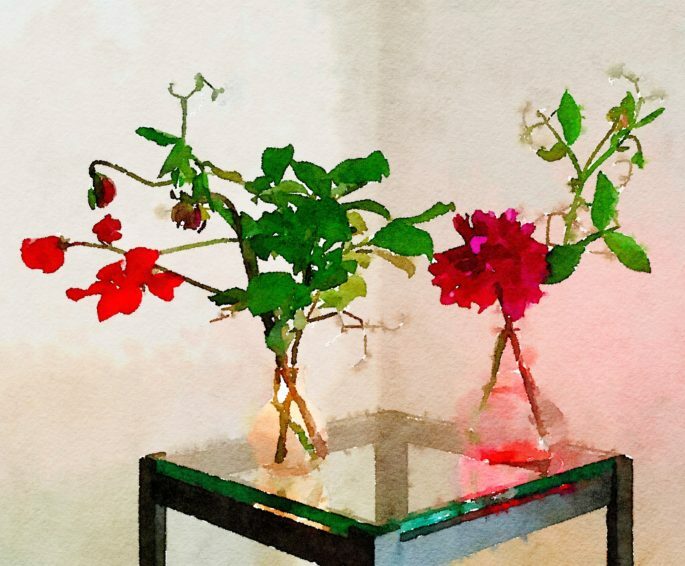 As I always do, I released the blossoms from their white butcher-paper wrapper, unwound the bouquet’s rubberband-bound plastic bags and moist newspaper, and placed the flowers back on the stretched-out butcher paper. 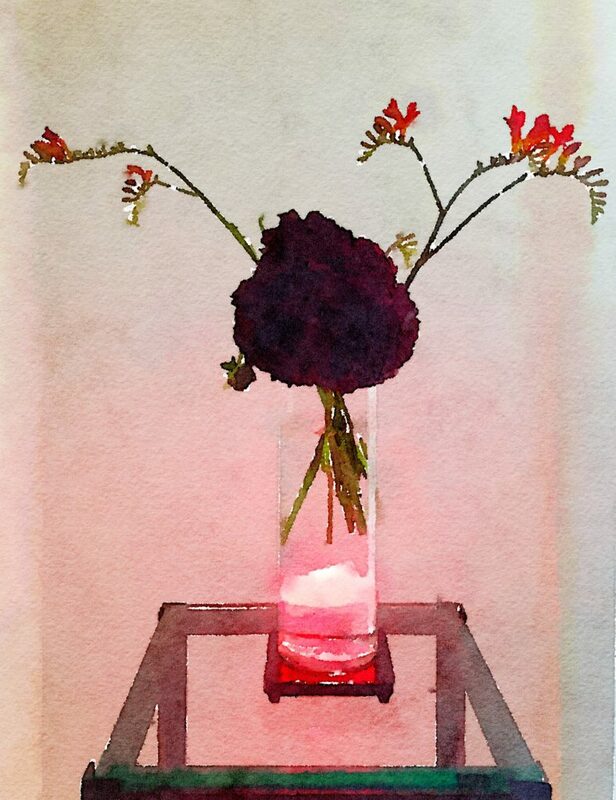 I made sure the stems were cleared of small leaves and recut the ends, then stuck all the flowers in this shiny black vase so I could figure out exactly what I had. 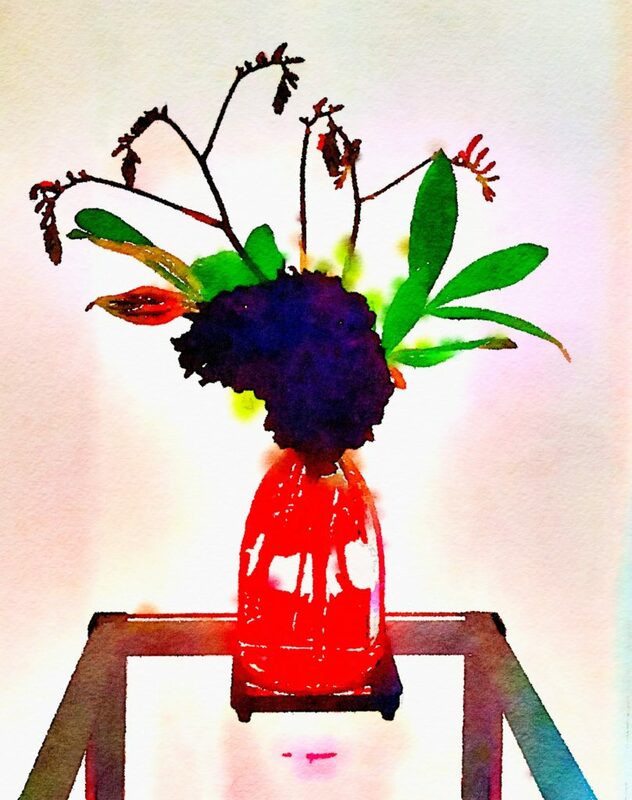 I snapped a photo because I was so taken with the result of this impromptu bouquet. Glorious! 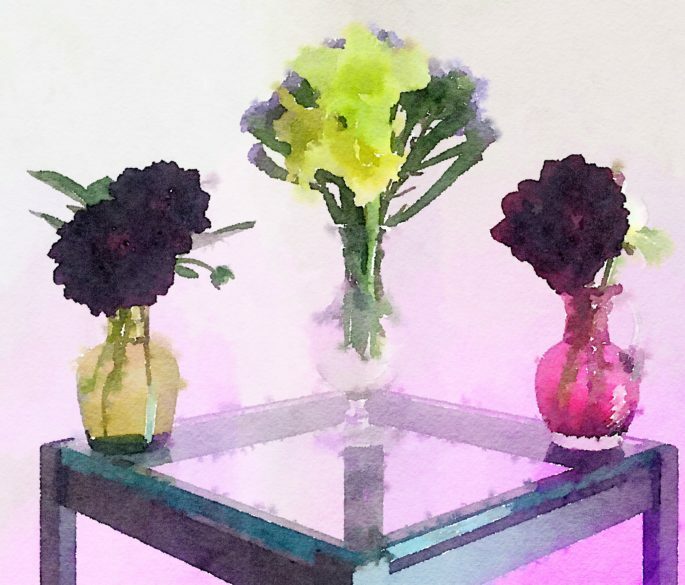 But I knew that I didn’t want to use all of the Week Twenty-Three flowers in one arrangement. 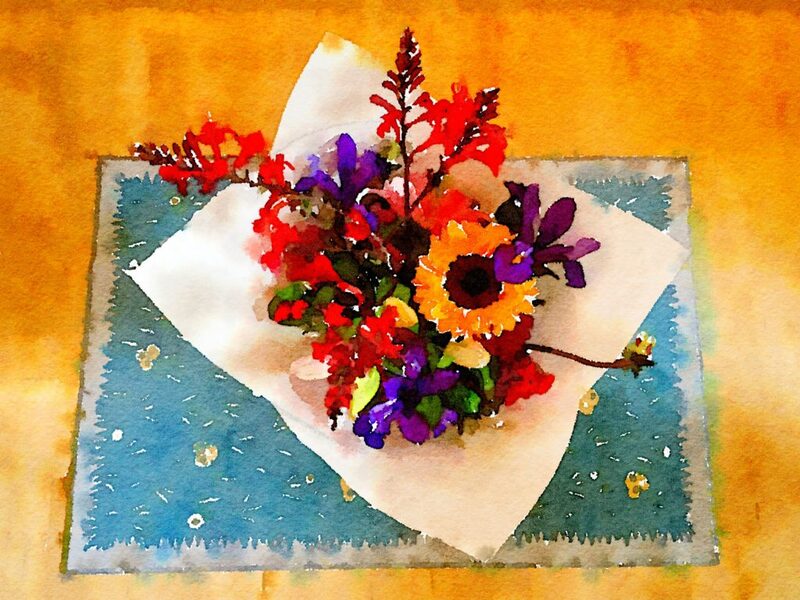 So (rather sadly) began to design individual bouquets. Here is the first one of those. 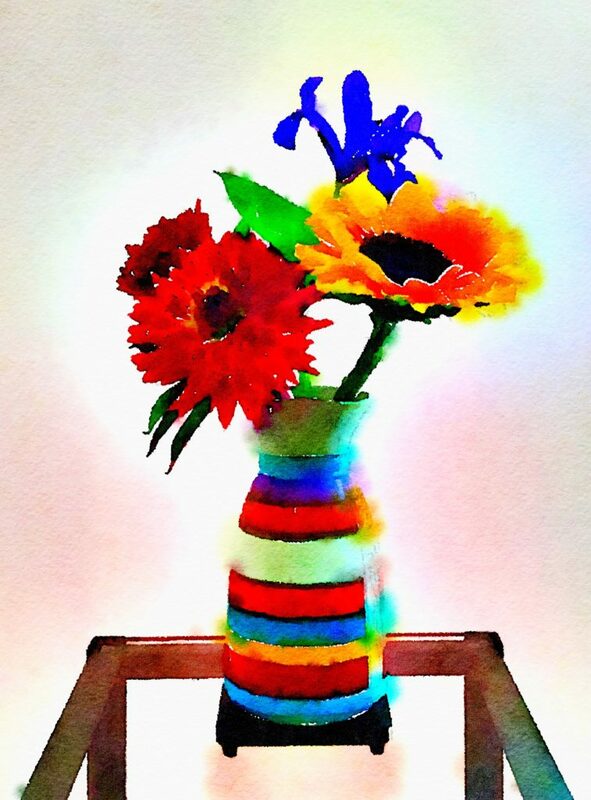 The second one is an ode to the paintings of Vincent Van Gogh. 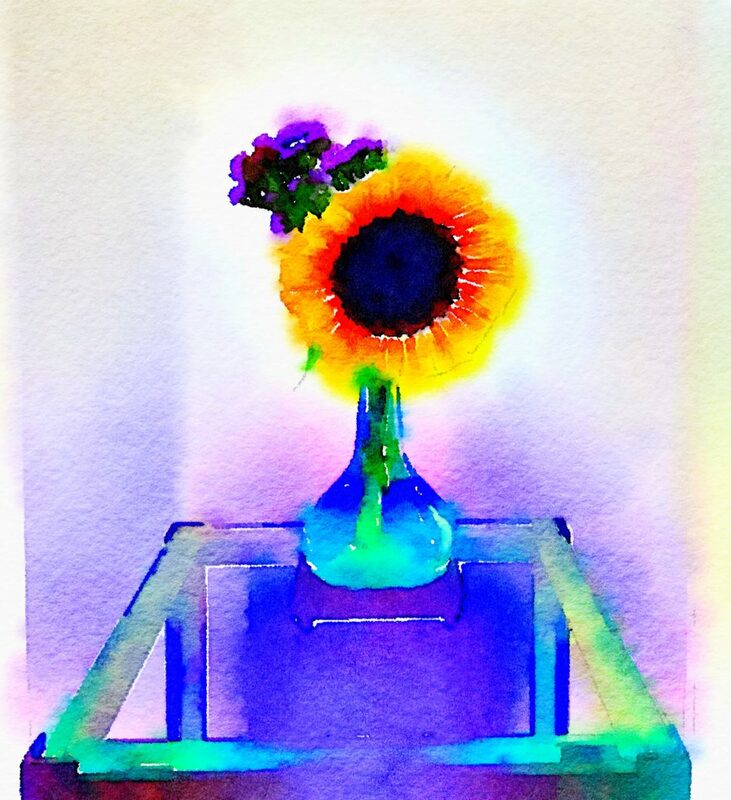 BRIGHT COLORS! 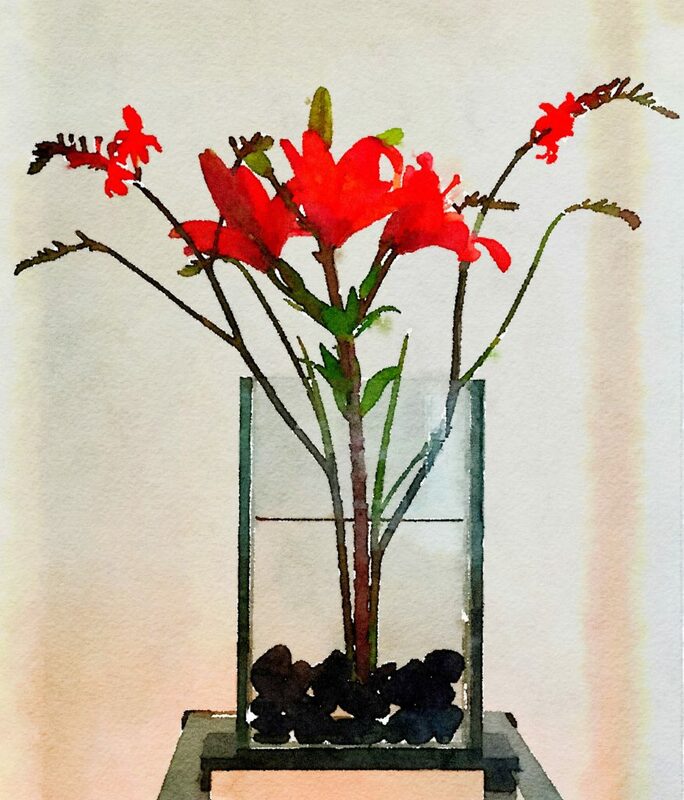 My favorite colors came into play in the arrangement below, which includes a single intoxicatingly fragrant Stargazer Lily (rife with blossoms that I could hardly wait to watch bloom over the coming days), and selected greenery to create a fluffy frame. 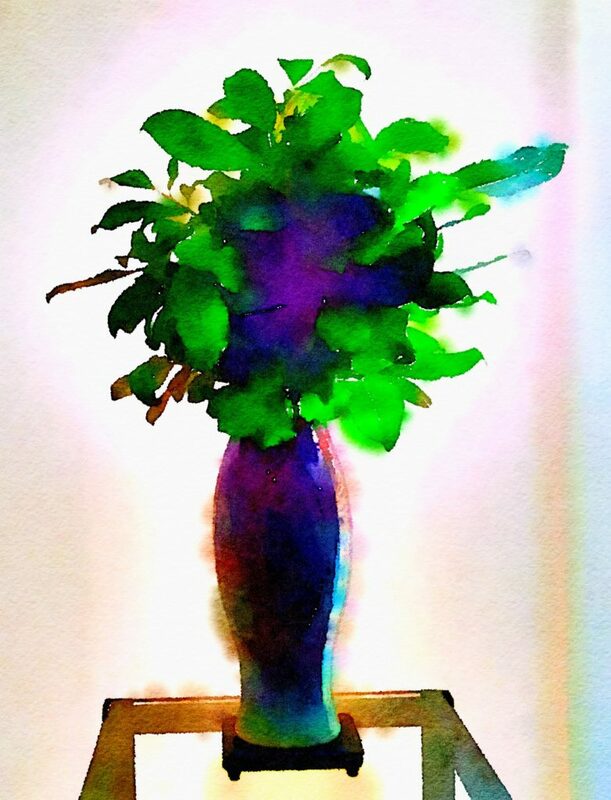 The “Bold” setting of the Waterlogue app created this dramatic version of the same vase with only the greenery from the Week Twenty-Three bouquet. 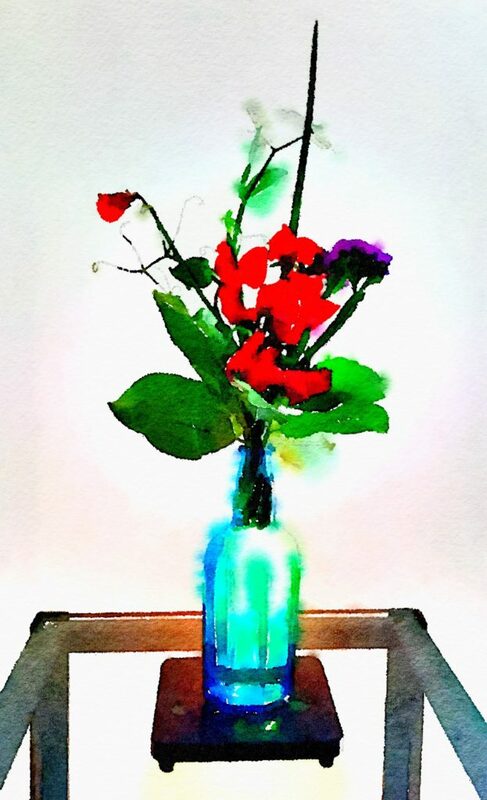 My favorite small blue-glass vase forms a fitting contrast when planted with red sweet peas and purple flowers. I love the romantic way the red and purple flowers drape in the two small bouquets below. 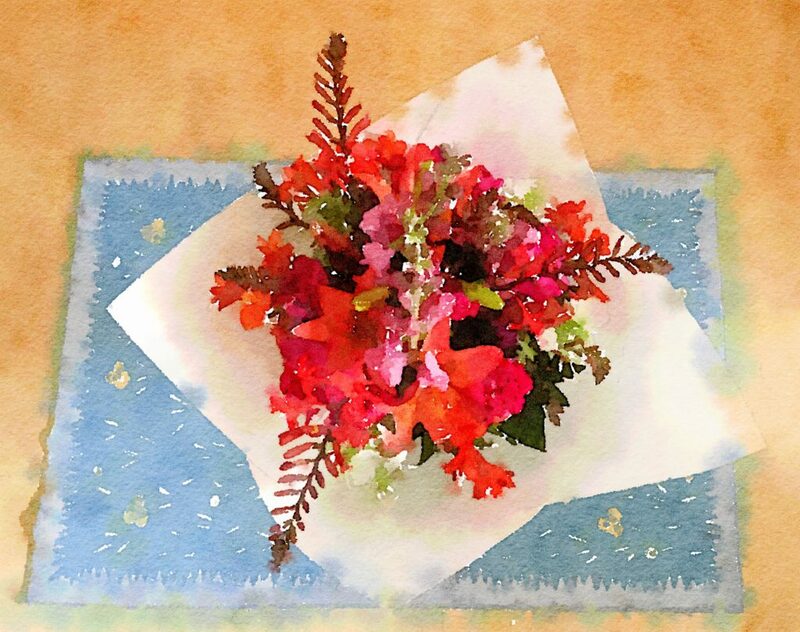 And here are the small bouquets from Week Twenty-Three. These miniature arrangements decorate the twin vanities in our bathroom and one sits next to the television in the bedroom.